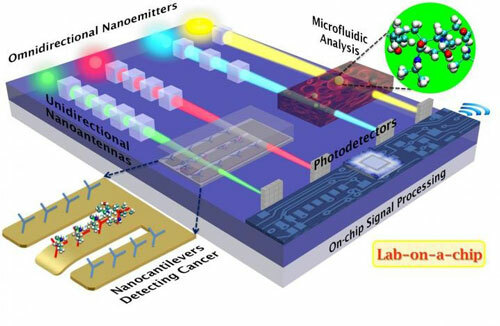 (Nanowerk News) Newly developed tiny antennas, likened to spotlights on the nanoscale, offer the potential to measure food safety, identify pollutants in the air and even quickly diagnose and treat cancer, according to the Australian scientists who created them. The new antennas are cubic in shape. They do a better job than previous spherical ones at directing an ultra-narrow beam of light where it is needed, with little or no loss due to heating and scattering, they say. In a paper published in the Journal of Applied Physics ("Optically resonant magneto-electric cubic nanoantennas for ultra-directional light scattering"), Debabrata Sikdar of Monash University in Victoria, Australia, and colleagues describe these and other envisioned applications for their nanocubes in "laboratories-on-a-chip." The cubes, composed of insulating, rather than conducting or semiconducting materials as were the spherical versions, are easier to fabricate as well as more effective, he says. Sikdar's paper presents analysis and simulation of 200-nanometer dielectric (nonconductive) nanoncubes placed in the path of visible and near-infrared light sources. The nanocubes are arranged in a chain, and the space between them can be adjusted to fine-tune the light beam as needed for various applications. As the separation between cubes increases, the angular width of the beam narrows and directionality improves, the researchers say. "Unidirectional nanoantennas induce directionality to any omnidirectional light emitters like microlasers, nanolasers or spasers, and even quantum dots," Sikdar said in an interview. Spasers are similar to lasers, but employ minute oscillations of electrons rather than light. Quantum dots are tiny crystals that produce specific colors, based on their size, and are widely used in color televisions. "Analogous to nanoscale spotlights, the cubic antennas focus light with precise control over direction and beam width," he said. The new cubic nanoantennas have the potential to revolutionize the infant field of nano-electromechanical systems (NEMS). "These unidirectional nanoantennas are most suitable for integrated optics-based biosensors to detect proteins, DNA, antibodies, enzymes, etc., in truly portable lab-on-a-chip platforms of the future," Sikdar said. "They can also potentially replace the lossy on-chip IC (integrated circuit) interconnects, via transmitting optical signals within and among ICs, to ensure ultrafast data processing while minimizing device heating," he added. Sikdar and his colleagues plan to begin constructing unidirectional cubic NEMS antennas in the near future at the Melbourne Center for Nanofabrication. "We would like to collaborate with other research groups across the world, making all these wonders possible," he said.